OS grid reference: SD 5853 0628. 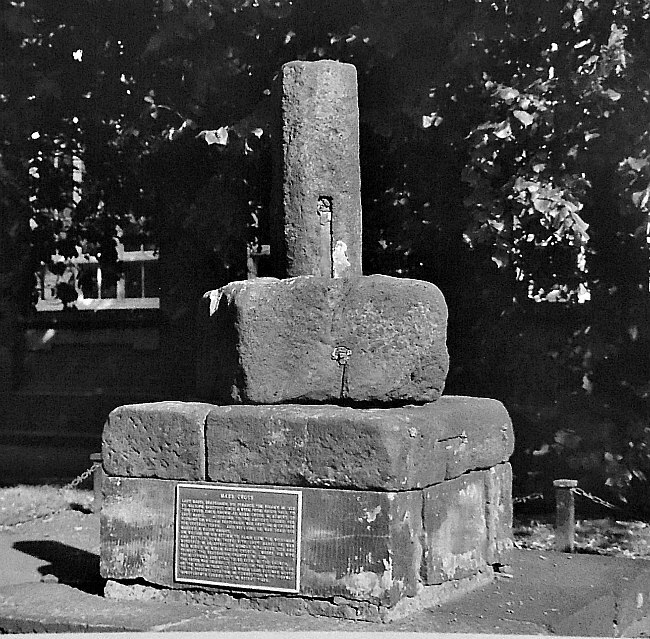 At the east-side of Standishgate, just off Wigan Lane, Wigan, Lancashire, stands the rather weather beaten monument known as Mab’s Cross, Mabel’s Cross, or Wigan Cross, which dates probably from the 13th century. It is named after Mabel de Bradshaw, wife of Sir William de Bradshaw, of Haigh Hall in Wigan. But there is an interesting, though an also somewhat sad and painful story to tell that has long been associated with the old Wigan Cross, a tale of deep remorse and, at the same time, unrequited love. In All Saints parish church in Wallgate, Wigan, stands the altar-tomb of Mabel and her husband William de Bradshaw, a now rather forlorn and sorrowful monument with effigies of the two – whose legend has continued down through the ages since they both rested here in the 14th century. The cross is located by a footpath in a garden at the front of Wigan Girls’ High School, just to the north of Wigan town centre, and a little to the west of the A49 (Central Park Way). Mab’s Cross or Wigan Cross is very battered and worn from centuries of wear and tear, weather, and other damage. It stands at 2.3 metres (6 foot 5 inches) high; its stump could be a remnant from the Saxon age, though more likely it is medieval – mid 13th century. Its large step is more modern, probably not the original step(s), but the plinth is well-worn and is made up of a large slab on top of gritstone blocks with a plaque attached to this, while the worn and broken stump is socketed into a large, rough base. The monument was moved to its present position in 1922 from the opposite side of the road. It is surrounded by railings and is grade II listed. The often-told and very sad story, with minor variations, about the life of Lady Mabel de Bradshaw (Bradshaigh) of Haigh Hall, Wigan, is this: Mabel’s husband Sir William became involved in a local rebellion against the powerful Earl of Lancaster, known as the Banastre Rising, but this proved unsuccessful so he was forced to flee abroad to escape his enemies, according to author Kenneth Fields in his work ‘Lancashire Magic & Mystery’. Almost certainly Sir William goes off to fight in the crusades (c1314), but 10 years pass by with no sign of him returning – Mabel believing him to be dead – she decides to marry a Welsh knight, Sir Osmund Neville. Then, eventually Sir William turns up in Wigan market-place dressed as a beggar; Mabel recognises him and they finally return to Haigh Hall. But upon finding out what has transpired in the intervening years, he confronts Sir Osmund on horseback, and in the deadly combat Sir Osmund is killed at the place called Newton Park (Newton le Willows). The two are then ‘said’ to have lived happily together at Haigh Hall – at least that is the theory! Mabel’s confessor now orders her to do penance for what she has done. She is told to walk barefooted and barelegged on pilgrimage once every week from Haigh Hall to Wigan Cross [Mab’s Cross], a distance of 2 miles, which she does do for the rest of her life, but now Mabel is re-united with Sir William and is happy once again? Sir William de Bradshaw dies in 1333 and the almost saintly Mabel builds a chapel for him (1338) in Wigan parish church (the Bradshaw Chapel) also called The Lady Chapel; she then has effigies carved on his tomb, one of her husband cross-legged and wearing armour, with sheild at his shoulder – his sword almost drawn from the scabbard and, one of herself in a long robe next to his; and on the sides of this the whole ‘sorry story’ is told in detail with various sculptures, including one of Lady Mabel with candle in hand praying at the foot of her cross. Mabel died in 1348 at the age of 30. Of other interest in All Saints church is a Roman stone, part of an altar dedicated to their god Mithras, built into the splay of one of the windows of the tower, a relic from when the Romans had a fort or settlement (Coccium) on the outskirts of the town at Castle Hill, and where legend says: King Arthur fought one of his many battles. Author Joseph P. Pearce in his work ‘Lancashire Legends’ says: “The Roman road leading from Warrington to Preston and Walton-le-Dale, passed through the very centre of the town of Wigan, bearing the traffic of the Legions and the Guilds and Traders of old.” The present church is modern, but it stands on the site of a Saxon foundation. Close to the church stands the medieval ediface of Haigh Hall – where the famous Bradshaw family lived and which is still haunted by the ghost of Lady Mabel. Pearce, Joseph P., Lancashire Legends, The Ormskirk Advertiser, 1928. Categories: Ancient Crosses | Tags: Mab's Cross at Wigan in Lancashire, Mab's Cross in Standishgate at Wigan | Permalink.